Maggie Muggins Designs: Loads of Fun and a Giveaway! Loads of Fun and a Giveaway! Back at it again. The week we all had the flu we probably did the MOST laundry in one week ever done in our house. About 50 loads. My husband folded and I put away everything! It was amazing to sit there and enjoy my laundry free living room. That very same day, another load from the dryer was dumped onto our love-seat. I wanted to cry. It never ends. Lucky for me my husband does most of the laundry in our house. I know that it's the same for many of you too. Laundry is a never-ending task. It gets boring fast. I currently have four or five loads sitting on my love-seat waiting to get folded. I will get to it. Someday. Oh well, at least I don't have to iron anything. I have a distinct memory from my mission of helping a woman iron all her clothes. She ironed everything - and I really mean it. Maybe it's because it was all air dried. I'll never know - I didn't speak Spanish well enough to ask her then. OK, so back on track here. In honor of everyone who performs this monotonous task I've decided to have a little giveaway! It's a black vinyl piece that I cut on my Silhouette. The design is shown below. 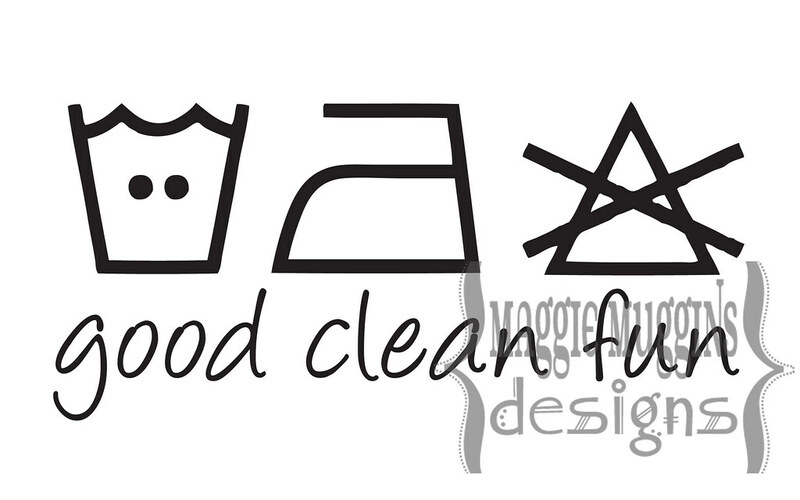 The Laundry symbols are Warm Wash, Iron, and Do Not Bleach. Size is approximately 7.5" long x 3.5" high. I realize that this and the other image above are complete misrepresentations of laundry. 5 cents is way too little to charge and fun is not how I would define it, but hey, the images are cute, aren't they? 1. Post a comment below and tell me who does the laundry in your house. Feel free to vent if you're the only one. I have comment moderation on so your post will not show up until after I approve it. 2. Only enter if you live in the U.S. or Canada, I will not ship anywhere else. 3. Giveaway ends next Wednesday April 21st, 2010 at midnight PST. The winner will be chosen randomly and announced by Thursday, Arpil 22nd. Please leave a way for me to contact you in case you win. If I can't email you from your profile leave some other way for me to contact you or make sure to come back and see if you won. Bryan and I share the evil laundry task at this time... though, I can imagine that switching when the time comes where I am mostly at home! But for now, I love sharing the responsibility!! I do most of the laundry around here. That doesn't mean that I get it done as regularly as I should, though. Oops, I guess I shouldn't admit that. I'm good at getting it all washed and dried, but the putting away part is not so good. We live out of the laundry baskets a little too often, I'm afraid. fun, a give-a-way! mostly, i am the laundry slave. and it is never-ending with my house of boys! our current status: 4 loads waiting patiently to be folded (and they've been that way for over a week, so we're living out of them too). yikes! wow... you mean someone actually has to do the laundry. Hmm...all this time I thought it just magically got done, folded and put in my drawer...Maybe Santa does it? I do most of the laundry in the house, which is my downfall. Laundry is a necessary evil as far as I am concerned. 7 peoples laundry is too much for 1 person to do alone on top of everything else (15-20 loads/week). But we have just this week started a new points system for my kids so they can earn the privilege of using the Wii. They get 10 mintues for folding and putting away batches of laundry, and 5 for changing the batches for me. I see an improvement already! Both in the their behavior and the speed at which the laundry is getting done. My husband has also decreed that he gets to fold all the towels everynight. With the number of showers and the constant cleanup around here, there are always lots of towels! No perfection yet, but I am learning the lesson that you must employ help. And my very kind mother was babysitting last night and folded laundry while she was here too. Thanks Mom! I'm the only one who does laundry, but my girls help sometimes. I have a laundry schedule from Monday to Friday and I'm not good at sticking to it ;) But I'm lucky I have my laundry room upstairs so it makes it easier to DO laundry. I'm glad to hear that I'm not the only laundry slave husband in the group ;) Go Brock! As an aside, I did the laundry BEFORE we were married. That's right. I was whipped from the get go.